Come annullare l’incidenza delle mutilazioni genitali femminili in Europa? [Before going in depth into it, it is necessary answer some important questions in order to have an overview of Female Genitale Mutilations (FGM)]. FGM as all procedures involving partial or total removal of the external female genitalia, or other injury to the female genital organs for non-medical reasons. How many females are still subjected to FGM? FGM is concentrated in 29 countries in Africa and the Middle East but FGM has also been documented outside these countries, including India, Indonesia, Iraq, Malaysia, Colombia, and Peru. UNICEF (2013) estimate that more 150 million girls and women worldwide have been cut with over 125 million of these living in the 29 high prevalence countries located in Africa and the Middle East. Each year it is estimated that 3 million girls globally are at risk of FGM. The most recent data shows wide variation in FGM prevalence. The practice is almost universal in Somalia, Guinea, Djibouti and Egypt, with prevalence levels above 90%. In Cameroon and Uganda on the other hand, prevalence rates are approximately 1%. With increasing globalisation and many people from FGM practising countries migrating to the EU and other developed regions, the practice of FGM is no longer restricted to the traditional practising countries. There are now substantial populations of girls and women living in the EU who have been subjected to FGM or who are at risk of FGM. The origins of FGM are unknown. However, some scholars have suggested that it has been practiced for over 2000 years. For many it pre-dates any of the major monotheistic religions such as Christianity, Islam and Judaism and thus it is not connected to any particular religion, culture, or socio-economic group. FGM takes place in many countries and communities with diverse religious belief systems, including Christian and Muslim. All communities where FGM is common are highly patriarchal, with FGM often defended as a rite of passage from girlhood into womanhood and preparation for marriage. It is used to curb female sexual desire and protect virginity. In some communities, it is justified for health and hygiene reasons, ‘purity’ being a word often used. How to end Female Genital Mutilation in Europe? 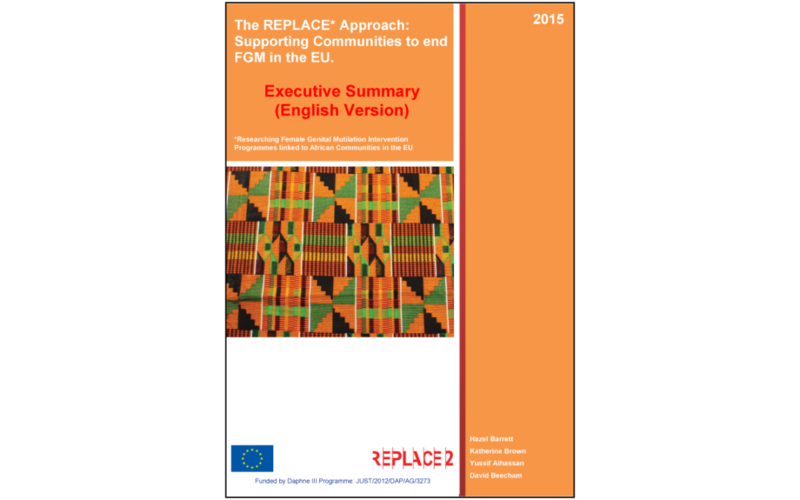 The Replace 2 study aimed at identifying the migrant communities that are still practicing Female Genital Mutilation (FGM) in Europe, and at designing interventions towards the end of the practice. The peculiarity of the Replace 2 project stands in being a Community-based Participatory Action Research (CPAR), an approach used to engage members of FGM affected communities to understand the social norm supporting FGM. It is an approach to collecting information that puts communities at the centre of the research process and enables them to contribute to the research, to be listened to and to be empowered by the process so that that they can take action to tackle FGM. The approach is based on empowering and motivating FGM affected communities through community leaders, influential people and peer group champions to challenge the social norm supporting FGM. The REPLACE Approach incorporates both individualistic and community-focussed behaviour change theories. It recognises that some individuals are in less powerful/influential positions than others and even if they wanted to abandon FGM, they are not able to do so for fear of social exclusion and community rejection. It is very important to understand the beliefs and the social norm supporting the continuation of FGM and identifying the barriers to change. As mentioned above, the CPAR engages both the researcher and the communities together to collect information regarding individual and community practices and beliefs associated with FGM and the perceived barriers to ending the practice. It empowers communities and ensures interventions are sustainable. REPLACE recruited Community Based Researchers (CBRs) and peer group champions and trained them in CPAR methods in order to allow them to fully participate in the REPLACE Approach and to ensure interventions were culturally sensitive and appropriate. It is a fundamental step in the research process because it helps to target, implement and assess the effect of activities and interventions and to ensure the level of impact. It allows interventionists to learn what works and what does not, as well as what needs improving or changing. The Replace approach is concretely implemented through the Cyclic Framework for Social Transformation (CFST). This is a cyclic model for tackling FGM based on a combination of individualistic and social-based behaviour change theories. It recognises that in order to end FGM a number of cycles of behaviour change will need to take place within the community. This initial phase consists in engaging with the targeted community. It aims at creating a sense of ownership over the intervention by community members and enables them to work together with the interventionist to determine the most appropriate way to address the problem. One of the main objective of this phase is to gain the trust of the community and to reduce the community resistance towards the intervention programmes. In this phase the Replace 2 partners focused in highlighting the people to be involved in the research: who undrego FGM in the comunity, who are the beneficiaries and perpetuators of the practice, who are the influential persons. Moreover, they created contact with stackolders, local authorities, orgaizations invonved in the topic. This phase consists in locating the believes and mechanisms that support the continuation of the practice among the comunity. Replace 2 conducted this phase of the research through Focus Groups Discussions (FGDs) and Narrative Interviews. Therefore, the data collection and analysis were conducted through the software Nvivo. It allowed coding all information estapolated from the recordings of the Narrative Inteviews and the FGDs. Nvivo gave space for an interpretative type of analysis conosdering that through this system a piece of text could be coded differently by different people. This phase consists in assessing the comunity readiness to undertsand the believes and to change them towards the end of the practice. The comunity’s stage of readiness to end FGM gives a strong indication of where a comunity is on the continuum of social norm transformation and helps inform the type and content of activities and interventions that should be used with the community to shift behavioural change towards the goal of ending FGM. Somali Community living in Netherlands Between vague awareness and Preplanning: there is community recognition that something must be done to end FGM, but efforts lack focus. The biggest worry is that many women within the comunity do not count the lightest form (sometimes called sunna) as a type of circumcision. Religion is still a problem, women know female circumcision is culture, but there is no Imam in the Netherlands originally from Somalia, circumcision is culture, but there is no Imam in the Netherlands originally from Somalia, who dares to speak out and state that female circumcision is not necessary to do and that there is no need for sunna. This phase conisists in designing ad hoc interventions based on the communities readiness level (please see table above). It draws on and applies theoretical ideas concerning readiness to change, behaviour change and targeting problem behaviour from both individual and community-based theories of behaviour change intervention development. It does this in collaboration with the comunity of people where change is desired. When enough people are reached, experience attitude change and as a result alter their behaviour towards FGM the comunity will be one step nearer achieving the goal of ending FGM. Sudanese Community living in UK Organisation of a comunity event to present sessions on the health consequences of FGM types I and II and challenge the belief that FGM is required by Islam and have break-out discussions in three languages FGM is not a requirement of Islam. This last phase of the project consisted in evaluating both qualitative and quantitative methods used in the delivery of the interventions and incorporate the results in the next iteration of the cyclic framework. Evaluation questionnaires and focus groups were delivered to participants of the inteventions at the beginning and the end of the intervention in order to observe whether a change of view was reached by comunity members. As it is understandable by the table above, the level of awareness in each target community was different so this caused very different interventions for each country. The reason for performing FGM varys between etnic groups and communities. Interventions must therefore recognise the diversity of the reasons and be tailored through different communities. For part of the Somali community (Rotterdam, the Netherlands) FGM is being seen as a religious practice, this was identified as problematic and a barrier to change. Dutch Somali Koranic School teachers needed support in order to be able to deliver lessons in Koranic Schools that addressed religion and FGM. Through training and group discussions community women, who included Koranic School teachers were provided with information. During an Islamic scholar, at the Islamic University of Rotterdam Prof. Dr. Hidir presented clear arguments based in evidence from the koran and the Hadiths that FGM is not a requirement and not even approved in Islam. “There is no clear authentic religious text that supports the practice”. The explanation by Prof. Dr. Hidir gave a strong and broader narrative that incorporates ‘the do-not-harm principe’ in Islam. Working with the REPLACE 2 team, the group devised a lesson plan to support delivery of the Koranic School lesson, so that the Koranic School teachers had a clear guide about what content to deliver, in what order and in what ways. The group delivered pilot lessons and watched each other and provided feedback and praise to one another. The interventions in Spain were carried out in a neighbourhood of the town of Banyoles that is mostly inhabited by migrant families coming from South Saharan countries where FGM is still practised to a greater or lesser extent. The most numerous comunities are of Senegalese and Gambian origins, although there are also persons who come from Mali, Mauritania and some other country from Western Africa. The interventions were developed in two stages. The first one involved two working meetings with a number of community women who had previously participated in the project regarding a diagnosis of the practice of FGM in the community. These meetings served to jointly identify the activities that the group considered the most appropriate and effective to make progress towards the abandonment of this practice. It was the outcome of this work that led to the design and organization of the interventions to be carried out in the following stage. An analysis of the cultural differences between countries of origin and the host countries: Positive and negative aspects of each culture. An analysis and debate about the relationship between gender equality and economic growth. An analysis and debate about women’s right to control their sexuality and the FGM. An analysis and debate about women’s health and women’s sexual health and about the effects of the FGM on it. Skill development: An outlook on how to counteract the community’s beliefs in favour of FGM. An analysis and debate about FGM and religion. A working day devoted to the planning of future actions for the abandonment of this practice. A working day devoted to evaluate the project interventions on the part of the participants in these working sessions. In Portugal APF did a training course on Community Mediation with 11 people from 27 to 68 years old as it was wanted to bring older people to this training. The training was focused on building capacity of this people to be community mediators in the harmful practices issues so they can become agents of change in their own communities. It was very important for them to understand how they could bring to discussion such an important topic to the work they are already doing. The training was very fruitful especially for women that talked publicly about this topics for the first time. Another aspect that we would like to highlight was the commitment they bring to the designing of future activities, despite the initial lack of expertise and knowledge on how to do it. The interventions that took place in the city of Palermo (Sicily) were designed starting from the needs of the Habeshà community. According to the research done, the issue to focus on were about gender issues and building a sense of comunity. The intervention consisted in creative workshops based on photography, video editing and oral storytelling aimed at raising awareness about sensitive topic such as the gender differences, the roles of men and women within both family and society and the meaning of being part of a community. All these issues leaded then to touch the topic of FGM. Adopting mainly visual tools allowed the involvement of people with different levels of schooling and of speaking Italian. Therefore, using images could allow all people to express themselves. The following part will go through the five main steps of the project development described above and focus on how they were applied by CESIE working with the Eritrean and Ethiopian community of Palermo. According to data of Caritas-Migrantes 2012, foreigners living in Sicily are 86.158 and 44,4% of these are women. They mostly concentrate in Palermo (20.224, 47,3% of these are women), Messina (15.896, 48,2% of these are women), Catania (15.429, 49,2% of these are women), finally Ragusa, with 11.459 foreigners, of which only 33,8% are women. The most common non EU countries of origin of immigrant communities in Sicily are (from the highest number of members): Tunisia, Morocco, Sri Lanka, China, Albania, Philippines, Bangladesh, Mauritius, Ukraine, USA, Ghana, India, Eritrea, Somalia, Russia. Among the ones listed above, CESIE decided to focus on the Ethiopian and Eritrean community based on the fact that they had one of the highest prevalence rates of FGM in the home countries, and because of the relationships that CESIE had already established with community members of these communities that would facilitate the implementation of the research and intervention strategies. After having the first contacts with community members, it was clarified that Eritrean and Ethiopian refer to themselves with the term Habeshà, self-descriptive cultural definition derived from “Abyssinia”, today applied to members from the Tigrinya ethno-linguistic group, as well as Tigrinya- and Ahmaric-speaking Christians in Ethiopia. Other ethnics groups considered as Habeshà are Gurage people. Tigrinya and Tigre constitute around 85% of population in Eritrea, while Amhara, Tigray and Gurage peoples are less than 40% of the population of Ethiopia. Habeshà is used to refer to anyone from these countries, but not all the people identify themselves with this definition. Even through the Habeshà come from different countries, they share a common identity and culture. Both Eritrea and Ethiopia were part of the same country until Eritrea seceded in May 1991 after a long history of separatism struggle. The Habeshà community in Palermo is made up of mainly transient migrants. Some of them have lived in this city for a long time, but the majority of them have stayed here less than 10 years, which determines a strong connection with their home countries. Individuals in this community have few meeting places and opportunities for community cohesion. The community also has no official, recognised leadership. In the absence of leadership, the community organises itself through the friendship network. They often come together and support each other during occasions such as bereavement, weddings, and baptisms. For example, during the Lampedusa tragedy in October 2013 in which 368 immigrants died crossing the Mediterranean sea, the whole community came together and offered support to victims and relatives. In Palermo, the members of the Eritrean and Ethiopian communities are, for the most part, unemployed or underemployed living on odd and/or informal jobs. Many of them stay transitorily in Sicily while waiting to emigrate to other places in Europe. Most people in this comunity dream of migrating abroad to countries such as Norway and Germany. The second main phase consisted in conducting a community engagement, to identify those from Habeshà origins who could be involved in the project. This phase contributed to expand CESIE’s networks among the migrant communities living in Palermo and to better understand the needs and challenges of migrants living in the city. Informal meetings were held in CESIE office in public places of the City with community members reached through CESIE networks in the migrant communities living in Palermo. Among the people reached, CESIE started to identify those who are more influential, the dynamics among the community, the perception of being Ethiopian or Erithrean but belonging to the same Habeshà. After this phase, four CBRs could be engaged. Two of them were more involved with Italian community, the other two more with the Habeshà, all of them working for the emergencies. Qualitative data analysis with Nvivo programme. The training was conducted following the training package developed by Coventry University. Eight FGDs were conducted, consisting of four male only groups and 4 female only groups. Also, 20 in-depth individual interviews (10 male and 10 female) were conducted. The research was completed with other 5 narrative interviews to influential members from the community that were undertaken in 2015 by another researcher. A total of 47 participants were involved in this phase of the project. Data collection was not easy: many participants often deserted the meetings at the last moment; others (especially women) were often shy and reticent about the topic. The interviews were carried out in respondents’ homes while the FGD were carried out in public places deemed appropriate by the participants. The data were analysed with the aid of Nvivo programme. This mainly focused on drawing out the key themes in the data. Nvivo allowed to identify and to classify the most relevant topic to be investigated among the target community. Particular attention was paid to differences in perceptions based on gender, age and length of stay in Italy. The results of the analysis are presented in the sections below. The sense of brotherhood is strong not only in family ties. It is a common bond originated from belonging to the same people, or at least what was once “one people”. The Habeshà identity appears to have been adversely affected by colonial experience, this also a strong element of identity that reinforces the sense of belonging to a common matrix. Because of its history, the Habeshà comunity has ambiguous boundaries. The Habeshà comunty in Italy is not structured and there are no clear identifiable leaders. However, we can affirm that solidarity networks that are activated upon arrival of compatriots are a reality in Palermo. The existence of a comunity becomes one of the needs expressed by Habeshà along with other needs that characterise other comunities living in Palermo. The need for services that allow children to engage in recreational activities seem to be one of the main ones. They attribute the lack of a leader to these needs. In terms of gender relationships among Habeshà in their homeland and in Italy, we can affirm that they are complex: there is a general female awareness and women’s empowerment but the male control of wives and daughters is still strong. The gender gap is very strong within the community of Habeshà, but has partially faded after the War of Independence. In Italy Gender relationships are among those cultural traits that are significantly changed since Habeshà are in contact with the Western culture; for example they have become more equal. The needs of women include: equality, freedom and education. Most respondents affirmed that the role of women is not considered as important, even if they care of the majority of the tasks related to family caring, children education and housekeeping, and women themselves do not have awareness about it. The terms used to describe FGM are mkshiab (in Amharic) and grzad (in Tigrinya). The term circumcision is the most used by Habeshà comunity members to refer to the practice in both males and females, which for some of them does not differ but for others it is clearly not the same in terms of justification of the practices and their consequences. Indeed, for most of them, male circumcision is more accepted while FGM should not be performed. Female circumcision is motivated by the need to reduce and control the sexual desires of women so to prevent their sexual promiscuity. It was deemed necessary that women were circumcised in order to “discipline” their instincts. If a woman was not circumcised she was ostracised by the community because she was considered a “bad girl”. In this sense, some stereotypes that identified the woman not circumcised with the prostitute or the adulterous wife were widespread among comunity members. It was assumed that a not circumcised woman, who was going to be married, had already lost her virginity, and this was considered a disgrace for the family and for the whole comunity. According to some respondents, it is linked to the Muslim identity, to tradition, to ignorance or to a need of hygiene. Circumcision is considered part of the natural/traditional law. Who is not circumcised suffers social discrimination and is derided. An uncircumcised woman is considered to be “naked”. Most of the respondents agree that circumcision is carried out after 12-14 or 40 days from birth, or even 4 or 7 years in rural areas, so in the first case it is related to baptism, because it is carried out before it. Circumcision would be performed before 40 days because the wounds heal faster, but as it is described below it depends on ethnic and/or religious groups. For past generations, FGM was compulsory from a social perspective. Parents used to chose for their children. They lived in fact a big cultural isolation. It was a tradition that was handed down from generation to generation and was entitled only from the fact of being part of the culture of the people. The new generations have access to a vast horizon of knowledge that in part has made that they abandon this tradition. Indeed, they seem more to have control of their own destiny. Most participants were aware of the negative consequences of FGM. The mostly perceived it negatively, as a practice that is useless, harmful and conducted without the consent of child. Also here, a difference was noticed among young and older generations. The younger seem to be more aware of the consequences of FGM and agree with laws prohibiting the practice. Older generations performed the practice by tradition and because they had no awareness of the damage that FGM could cause. In the process of behaviour change, contact with Western culture is crucial. The subordination of women to men is acceptable if the dimension linked to the respect and complementarity of roles is maintained. Therefore, if women’s submission to men is part of their traditions, it can become a value to be preserved. But this does not mean considering FGM acceptable anymore. The findings from the study confirmed an earlier comunity readiness assessment that was conducted in the comunity. They showed that the Habeshà community in Palermo is still in the Denial / Resistance stage of the overall readiness to change in relation to FGM. This is partly because even though some comunity members recognise that FGM is a problem, there is little recognition that FGM is occurring in the comunity. However, despite individual willingness to change in relation to FGM, the lack of a formally structured community hinders any effort towards change. Consequently, supporting the formation of a formal comunity (with recognised leadership) appears necessary. Empowering women (already particularly active) could lead to publicly confront the issue of FGM and to propose information campaigns, as well as to reduce gender inequalities. The practice of FGM is strongly reduced both in the motherland and in Western countries, but there is still a cultural resistance, especially among older people originate from rural environments. The men and women surveyed agree that, rather than legislative action, educational interventions are needed. In this context, the Diaspora could take a leading role in the improvement of the change, by raising their awareness about gender inequalities and the risks and consequences of FGM. This awareness-raising and empowerment can have an effect in the lives of the newcomers from Africa, as part of the migration experience. This role is however strongly affected by the difficult conditions in which migrants are forced to live in Italy. Therefore, it would have been necessary to help them confronting each other about topics such as gender issues and community. The interventions were designed with this focus. The intervention consisted in creative workshops based on photography, video editing and oral storytelling aimed at raising awareness about sensitive topic such as the gender differences, the roles of men and women within both family and society and the meaning of community. All these issues leaded then to touch the topic of FGM. The choice of adopting mainly visual tools is because among participants there were different levels of schooling and of speaking Italian. Therefore, using images could allow all people to express themselves and telling about their backgrounds and views by simply choosing the pictures. Actually, all of them were enthusiastic to take part also in the storytelling phase. During the first meeting CESIE presented the background of the project REPLACE 2 and the program of the workshops: the issues to be dealt with, the objectives and the specific activities of each meeting. Team building activities were important to build trust in the group and break the ice among participants because some of them didn’t know each other. The overall objective of the meeting was to discover the possibilities of expression and communication of a photography and enable an autonomy of reading and an ability to perceive the thousand meanings hidden behind an image, moving from a passive use to a critical awareness, i.e. from users to active communicators through photographic experience. The photography was used as a privileged communication channel to express opinions, attitudes, beliefs, or recount experiences. A range of pictures linked with the topics of gender differences, sense of community and other topics not linked to them were proposed to participants. Each participant chose one ore more pictures and shared his/her thoughts. This simple activity helped to start introducing the topics and sharing different opinion towards them. The specific objective of the workshop was to learn how to tell a creative story, staring from the images chosen during the previous workshop. Using creativity and inventing stories with fake characters, allowed participants to participants to share more in depth information about their lives, own beliefs, attitudes, opinions without feeling judged. Each participant created his/her own story. Moreover, an open discussion as evaluation was conducted with the support of the questionnaire provided by Coventry. Once more, finding the participants for the workshops and keeping high their motivations to attend all the meetings, was not easy because of the reasons named above. Although, gathering women participants gave them the chance to open discussions about topics which wouldn’t be faced in a daily life such as what they like and what they dislike about the cultural background they come from, the different roles a woman can cover in her home country and in the hosting one, their needs and whish for the future, the meaning of FGM. Two questionnaires were given to participants: one before (baseline) and one after the intervention (follow up). These were accompanied by a final focus group where the attention was addressed on differences and similarities between men and women and on the relations that characterize the Habeshà culture. As mentioned above, the impact on participants was positive in terms of involvement. Even though it was hard to convince them to participate, once they were there they showed a high level of concentration and desire of knowledge. could be highlighted a change of view by some participants regarding the issue of gender equalities among families and in the society. From being “indifferent” or “quite agreeing” regarding the fact that man and women should be treated at the same way, the final questionnaire show that they “agree” to this. Indeed, the final focus showed a greater propensity to support certain opinions and to argue them appropriately. It showed a more critical approach to the questions raised, largely generated by the stimulus to discussion and sharing personal experiences. Some participants women openly expressed the desire of having a place where they could share their stories in a informal way with other women, not only with those ones belonging to their community. Starting to share information and experience from the gender issue helped the facilitator to introduce the topic of FGM which was faced by participants with and evident embarrassment, as it happened during the FGDs and in depth- interviews made by the CBRs. CESIE could therefore assume that initial resistance of participants to take part in the workshops was due to the denial of facing delicate topics and speak about them openly. This would confirm that the Habeshà living in Palermo are in a level 2 of the Behaviour Change Weel. Regarding the evaluation tools, CESIE believes that they were useful to monitor the development of each participant from the beginning to the end of the interventions. Rather, a big support from the facilitator was needed by participants to fill them because of the open questions: the lack of knowledge of Italian or English language created a barrier for answering the questions and made some participant feeling uncomfortable. What CESIE learned after the interventions experience is that there is a strong need of support among Habeshà comunity, in terms of having a concrete place where they could access information related to their rights and opportunities to integrate in the local comunity. At the moment, few Habeshà are integrated in the city, but the majority live quite isolated, nor integrated with their own compatriots or with Italians. The isolation causes a lack of chance for sharing information and opening up their view towards topics such as gender roles and the possibility of changing them. Moreover, CESIE learned how important is to connect different migrants communities living in the same city together. So the problem of isolation could be tackle not only linking one migrant community with the local one, rather creating cross cultural connection between Italians and several migrants comunities who actually share most of the needs and challenges. Regarding FGM, CESIE didn’t have the chance to learn something new from participants because their attitude towards the topic was not more open then during the research phase. The research in Palermo was affected by a peculiarity regarding the specific situation of migrants arriving to Sicily. Indeed, the dramatic facts of migrations flows in the island of Lampedusa and the massive deaths that involved many Eritrean and Ethiopian people during 2014 caused several adaptations during the project activities. NVIVO is a software used for qualitative research. It is based in coding all relevant information found in a text. It requires that the researcher thinks creatively and explores the data iteratively until all relevant codes are identified. Once the codes have been obtained, similar coded text should be regrouped into broader categories of meaningful patterns. Connell D. and Killion T., Historical dictionary of Eritrea, Plymouth, Scarecrow Press, Inc., 2011, page 279. 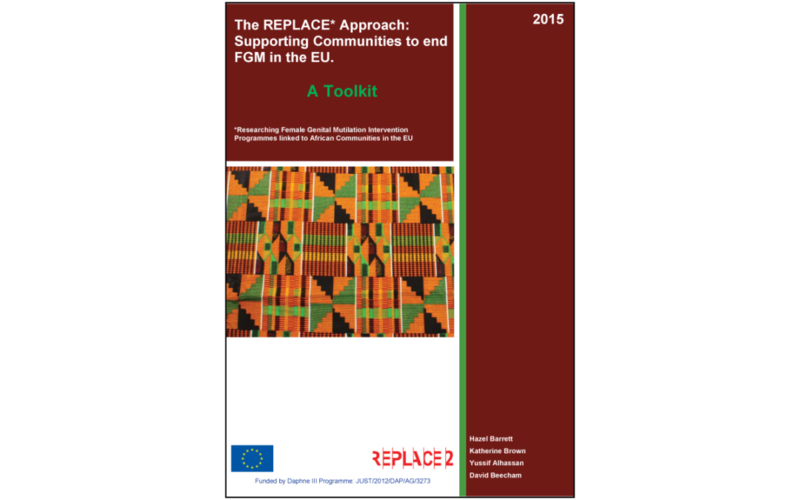 See p. 3 to refer to readiness to change behaviuor towards FGM in the affected communities of Replace 2 project. It provides a detailed background to the issue of FGM and what is known about it in the EU context. The approach of behaviour change is explained in detail with reference to relevant theory and literature. It provides practical informations straight to the issue of how to apply the approach in practice and aims to provide a step-by-step guide to be used in working in the field of FGM. It consists in a very brief edition of the two main products (Toolkit and Community Handbook) giving a more synthetic verison of the theoretical and practical inputs presented in the other two documents for and easier reading.